Home of Darling Dolls: handmade, unique, affordable. Announcement I am excited to be offering all of you FREE SHIPPING on orders of $25.00 or more (total) from October 15 to December 15 for this holiday shopping season! I am excited to be offering all of you FREE SHIPPING on orders of $25.00 or more (total) from October 15 to December 15 for this holiday shopping season! Just as pictured and it arrived very quickly. THE DOLL JUST ARRIVED AND IT IS ABSOLUTELY ADORABLE. SHE IS REPLACING A HOLLY DOLL I HAD WHEN I WAS A CHILD AND IT GOT DAMAGED IN A FLOOD IN OUT BASEMENT. Beautiful baby doll. Purchased this doll for my daughter who is obsessed with babies and she loves carrying it around the house saying "baby". Looks just like the photos, crafted with care. Highly recommended. Today in the studio - finishing up this doll to be at tomorrow's Portneuf Valley Farmers. If she is still with me when the market is over, she'll be listed in the shop next week! Getting ready for the weekly Farmers Market, which has been going well in terms of sales. I'm sewing like crazy to boost my inventory! In this pic, a little pre-Halloween fun with silly black kitties on a purple background. So love it when my dollies go on happy journeys! A selection of the baby dolls that I make. Fun and sassy Big Sister Dolls. Darling Dreamer Sets are a unique gift for your favorite little! Darling Classic Dolls that started it all! Still only $15.00! I've been sewing Christmas gifts for our numerous grandchildren (19 as of this writing!) for a number of years. It's an annual activity that I've enjoyed again and again, choosing projects and fabrics, etc., and striving to make something that will last and be useful AND fun. I made these adorable stuffed dolls for the youngest granddaughters in 2016 and then had several requests from others to make them for sale. Thus begins an Etsy shop. I took over the unused family room, roped my husband into making a HUGE cutting/work table to fill it, sorted my stash of fabrics into a spare bedroom, and got down to the fun. And, indeed .... fun it has been, all the way! I'm amazed how quickly a day passes when I'm in the studio. Given how much I loved handmade gifts as a kid -- because no one else had the same thing -- my very first priority for the shop was that every child should be able to own a handmade stuffed doll. So our Classic Baby Doll Line is -- and will remain -- an affordable item. Since opening in March 2017, I've added baby dolls with buttons, "big sister" dolls with long arms and legs, doll sleeping bags, and even a Bridal collection! I'm so very grateful for the positive reception of our many customers since we opened! I'm very pleased to make your acquaintance and I hope you will "favorite" my shop so that you will receive notice of new listings and updates. Career change in middle-age -- such a common theme these days! I learned how to sew quite late in life, and quickly grew to love the creative expression and usefulness of the craft. 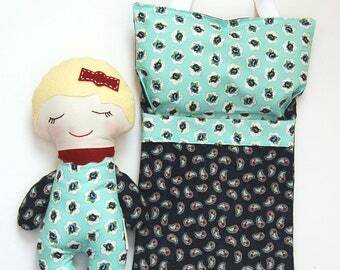 It's a joy to create these baby dolls and accessories for you! A worthy seamstress for sure -- and also my amazing aunt! She loves the Darling Dolls and how they can spark imaginative play for children, and she is enjoying creating items for our accessories inventory. To send updates and announcements from darling atelier designs.